This year we decided on a mid-January trip to St Lucia. St Lucia is a small Caribbean island about halfway down the leeward island chain. It's 239 square miles would fit into Rhode Island about 6.5 times. 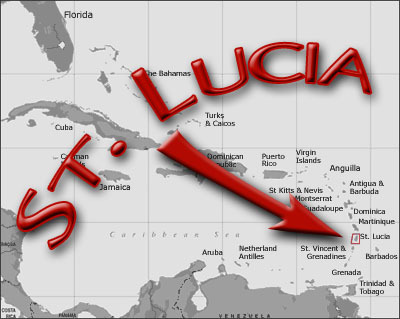 Thanks to the terrain (and roadways) of St Lucia, it takes longer to drive the length of St Lucia than it does to drive the length of Rhode Island. St Lucia's nearest island neighbor is Martinique -- just 21 miles away. This island has a very interesting history (see this link for more information). This was really just a trip for R&R, and not so much a photography trip. Of course, we still brought cameras and took pictures. We spent the most time sailing the resort Hobies, although there are no pictures of us doing so. We also did a fair amount of swimming and water skiing. The weather was WONDERFUL! It was upper eighties during the day and lower eighties at night. We had one day with a few passing showers, but not enough to keep us inside. Every day was generally very sunny and breezy.